Have you ever become obsessed with a food you’ve recently eaten? Obsessed might be a strong word, maybe preoccupied? You take a bite of something that completely surprises you, then can’t seem to stop thinking about it? To take it a step further, at least in my case, you constantly think of ways to use that particular ingredient in a recipe because you love it’s taste so much. Maybe it’s just me. I do enjoy food and I think that’s why I tend to obsess or become preoccupied with certain ingredients so much. I guess it could be worse, right? My most recent obsession has been dried figs. Simple, I know – figs?? Well to begin with, dried figs aren’t a food I regularly buy so I hadn’t eaten them in a while. Actually, it’s been a really long time. Dried dates I buy. Dried figs, not so much. I was reintroduced to figs recently when I revisited the Cuccidati recipe I grew up enjoying. I was preparing the filling that goes inside the cookie dough and found myself enjoying spoonful after spoonful. It’s a hard filling to resist – chocolate, figs, dates, walnuts, jam and honey. It’s incredibly delicious! As I was making Cuccidati, I kept thinking of other ways to use the dried figs and since the weekend was coming up, I thought scones would be perfect to enjoy. Scones really shouldn’t be reserved for weekends. They’re as easy to make as biscuits but the way they look and their slight sweetness makes them seem so special. 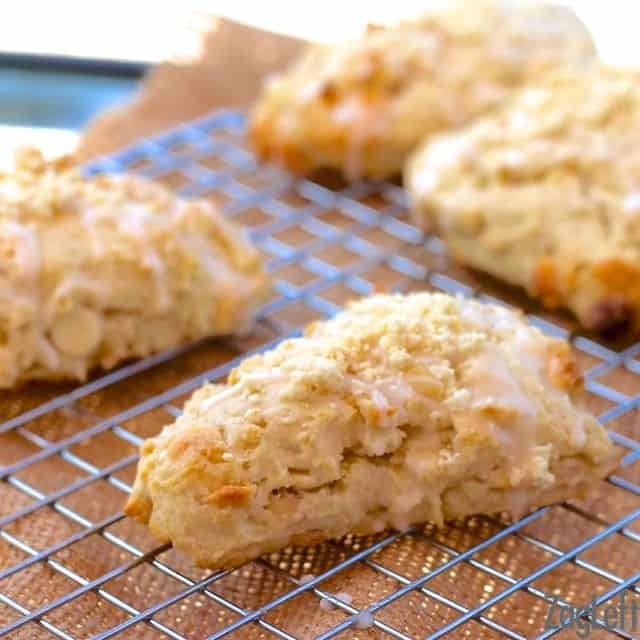 Scones are perfect for breakfast and they’re lovely when enjoyed mid-day with a cup of hot tea. They also satisfy my sweet tooth without the guilt of a sugary sweet cookie. These fig and walnut scones are buttery and rich. They’re not hard and crunchy as some scones can be. Instead, they’re delicate and crumbly and the figs and walnuts are perfect together. The figs provide a lovely soft burst of sweetness and the walnuts deliver a slight crunch. Dried figs retain their texture nicely when they’re baked in breads and that’s one of the reasons I love baking with them. I decided to give these fig scones a sweet glaze which is simply powdered sugar, maple syrup and a touch of milk whisked together. 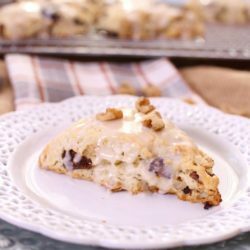 These buttery Fig and Walnut Scones topped with a sweet Maple Glaze are easy to make and perfect for breakfast or as an afternoon treat. In a mixing bowl, stir together the flour, baking powder, salt, baking soda, and sugar. Gently fold in the figs and the walnuts. In a small bowl, whisk together the powdered sugar, maple syrup and the milk until smooth. Spoon over each scone. I love the pairing of figs with walnut and maple here, I bet it’s an unforgettable combo! I’m the same way (I don’t normally buy dried figs), but I think I need to now! One of these beautiful scones would be perfect with a cup of tea or coffee. They certainly would be. Thank you, Faith! I love love figs but don’t cook with them often enough. Your scones look wonderful and I can imagine the taste. Delicious! I think maple and fig sounds like a wonderful combination. I would eat scones every day if only my waistline could handle it. I’m going to have to pick up some dried figs to fiddle with. I love dried figs, they’re great for snacking on. The maple and fig combination is a great one. Thanks, Kristen! I love delicate, crumbly scones! The added fruit inside is just a bonus! Thanks for the recipe! You are very welcome, Sabrina. Thanks for stopping by! Dear Joanie, I saw the picture of your gorgeous scones this morning on Twitter and have been thinking about them ever since! Wow. This New England girls loves all things maple. What a delicious treat, now all I need is a cup of tea! Thank you so much, Allie. They are certainly perfect with a cup of hot tea. Hi- I love all your scone recipes. But especially figs I just can’t pass up and I want them now!! Wondering if I just drop spoon (1/4 C maybe?) them would the baking time differ from original recipe? I’ll probably have these done and cooling before you get a chance to respond but no hurry I just thought drop scones would be that much faster ( so i’d get to enjoy them quicker that is)! Yes, you could make “drop scones” and they should turn out just fine. Have a great weekend!